Learn how to make our tasty Seafood Salad Sandwiches. 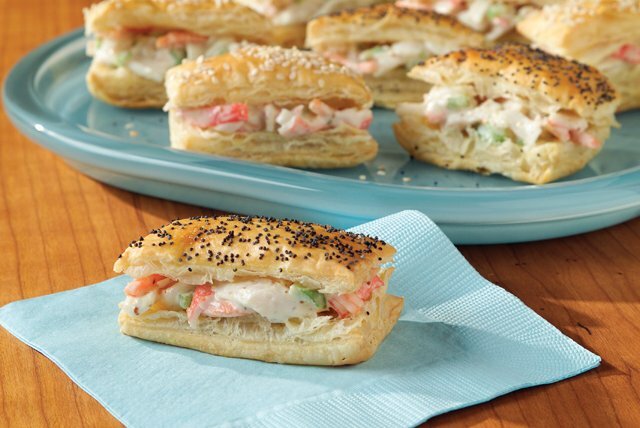 Our Seafood Salad Sandwiches are filled with creamy mustard-flavored crabmeat and vegetable salad. Combine crabmeat, vegetables, mayo and mustard. Refrigerate until ready to use. Unfold pastry sheets onto baking sheets; brush with egg white. Sprinkle with poppy seed. Cut each sheet into 18 (3x1-1/2-inch) rectangles. Do not separate rectangles. Bake 25 min. Transfer pastry to wire racks; cool completely. Separate pastry into rectangles. Split each rectangle horizontally in half. Spoon 1 Tbsp. crabmeat mixture onto bottom half of each split rectangle; cover with top of rectangle. Substitute 3/4 lb. salmon, cooked and flaked, for the crabmeat.